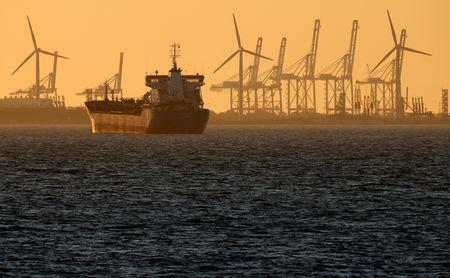 NEW YORK (Reuters) - Oil prices fell more than 2 percent on Thursday, with Brent slipping back from four-month highs as investors focused on the risk that emerging market crises and trade disputes could dent demand even as supply tightens. Brent crude oil <LCOc1> fell $1.56, or 2 percent, to settle at $78.18 per barrel. The global benchmark on Wednesday hit $80.13, its highest level since May 22. U.S. light crude <CLc1> settled down $1.78, or 2.5 percent, at $68.59 a barrel. The market tumbled early in the session as investors focused on the bearish elements of the IEA report, said Bob Yawger, director of energy futures at Mizuho in New York. U.S. crude production <C-OUT-T-EIA> fell by 100,000 bpd to 10.9 million bpd last week as the industry faces pipeline capacity constraints. Though weekly output slipped, the United States likely surpassed Russia and Saudi Arabia earlier this year to become the world's largest crude oil producer, based on preliminary estimates from the Energy Information Administration.